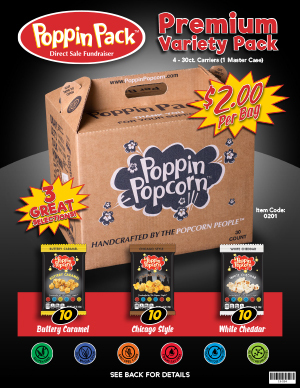 Our Poppin Pack brochures contain (1.5) - (3.25) oz bags of our delicious savory and buttery popcorn flavors. Each count carrier contains 30 bags, and there are 4-30 count carriers per case. Our Premium Variety Pack has three delicious flavors: 10 Buttery Caramel, 10 Cheesy Cheddar bags, and 10 Cheddar Jalapeno bags.